Ba Cham Dao (or some write it as Bart Cham Dao) is the final form in Wing Chun after the practitioner learns all the 5 preliminary forms (3 empty hand forms, 1 Muk Yan Jong/Wooden Dummy form, and 1 Luk Dim Boon Kwan/Long Pole form). The Ba Cham Dao will only be taught after a Wing Chun Practitioner has mastered all the other forms in Wing Chun Kung Fu. Ba Cham Dao is considered as the extension of the hands as it merely reflects the exact use of the hands in utilizing the double knives/broadswords. All the principals and movements that a Wing Chun Practitioner has learnt in the previous forms will be directly applied on the Ba Cham Dao. 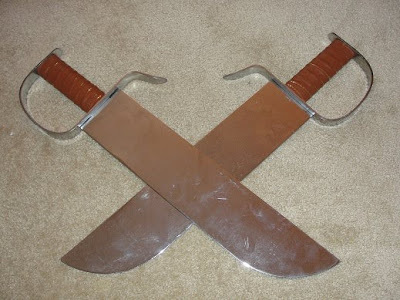 Ba Cham Dao literally means Eight Slashing Sword. The Eight Slashing represents the eight slashing angles of the Ba Cham Dao form in conducting the attack and defense movements. A Wing Chun Practitioner must keep remember the same principal in conducting the Ba Cham Dao practice as in the empty hand forms, such as when doing the low chopping position, he/she must never extends the hands fully; which the contrary is done by many Wing Chun Practitioners of the different lineage or even the same lineage under different masters. The main idea in the Ba Cham Dao form is simplicity as also applied in all other Wing Chun Forms. Use of direct thrusts and slashes are conducted rather than twirling the knives unless really necessary. Twirling/Flipping/Circling the knives indeed looks good, but in practice, it endangers the Wing Chun Practitioner from the attack of the opponent. It will put a Wing Chun Practitioner in a temporarily state of defensive mode. And if the twirling is done towards the body of the Wing Chun Practitioner, it will increase the possibility of cutting oneself; and also the opponent can use this opportunity to press the sword back to the body of a Wing Chun Practitioner. Nonetheless, still you may find many Twirling/Flipping/Circling in the other Wing Chun Style of the same lineage or different lineage. Why do we have to learn the Ba Cham Dao form? Some students may raise this question as we are living in the era when nobody brings knives or swords everywhere. However, the Ba Cham Dao form will teach a Wing Chun Practitioner for a better mind, hands, and body coordination, synchronization, and dexterity. Eventually, the result of practicing the Ba Cham Dao form will strengthen the wrists and arms of a Wing Chun Practitioner and complement back/increase the effectiveness of movements of the empty hand forms.